For those Santa Barbara and Montecito residents brave enough to venture down to the wilds of Carpenteria, Sly’s has thoughtfully provided valet parking with Signature Parking. A little reward for your trouble, as if great food, service, and terrific cocktails aren’t enough. 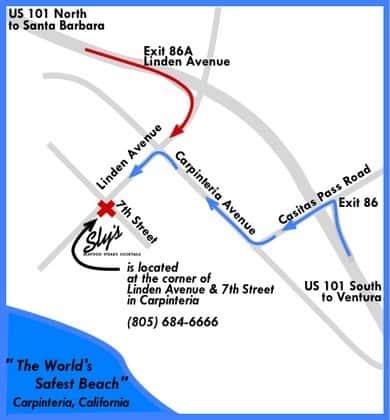 Don’t forget, we’re on the corner of Linden and 7th in Carpinteria. We have complete directions and travel options here.